Some of these cars live on. The Seven, in Caterham form, is still in production (although one wonders what Chapman would have made of Caterham in F1), and the Mazda MX5 Elan reincarnation has topped an astonishing 800,000 built to date and could be the first sports car to reach one million. The Lotus 72 (1971) is arguably still the most recognisable Formula One car of all time, and one of the most successful. Colin Chapman would be proud of the latest car to come out of the Hethel, Norwich, factory – the Lotus Evora S. It is without doubt the best road car ever produced by Lotus combining superb handling, exhilarating acceleration and real class. Forget past problems with build quality. The new Evora is put together to the highest standards, an immensely strong aluminium tub in which the driver and passenger sits, enclosed by a carbon fibre body. A visit to the factory is absorbing, no mass production here, hand-built cars slowly being assembled. Lotus has its own specially designed race track for the cars to be initially tested. And then it is out on the real road. Lotus Cars and Team Lotus have had a fractious relationship since Colin Chapman’s passing but with the resurrection of the racing team the association is now strong, each benefiting from the success of the other. The car company had a difficult year in 2012 regarding sales but with its Malaysian owner, Proton, itself being taken over (by local interests), there is a new vigour about the place with Regional Growth Fund money available as it develops new products and expands internationally. Team Lotus is winning races and Classic Team Lotus, run by Colin’s son Clive, flies the flag for the historic cars, beautifully prepared racers for a variety of enthusiastic owners. Lotus engineering skills are legendary within the motor industry. 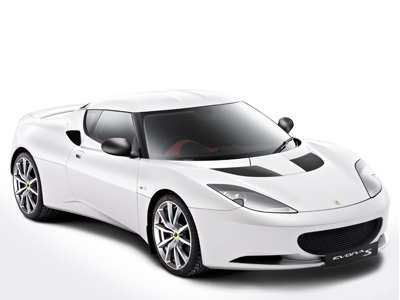 Other car makers’ outsourced requirements are an important part of Lotus income. Over 1,000 staff are employed in the ultra modern factory deep in the Norfolk countryside. The Evora S is a two plus two, but don’t get too enthusiastic about the rear seats. They look lovely and are ideal for short five-year olds. Power comes from a Lotus developed Toyota supercharged twin overhead cam 3.5 litre engine beautifully engineered with either a manual or automatic gearbox. With the auto box there is a sports mode but hardly necessary, the car quite quick enough with a 0-60 time of just over 5 seconds, the manual quoted as 4.4 seconds to the same speed. Paddle gear changes are provided. It is mid-engined and these days one has to be reminded it is petrol driven. The Evora interior combines comfort with function, blending sophisticated, high quality materials with precise attention to detail and superb craftsmanship. Machined aluminium features along with supple, hand trimmed and twin stitched leather. Recaro seats are provided, extremely comfortable. Getting in and out is problematical at first, but when you have acquired the art, very easy. A Lotus command centre with auxiliary trip computer and an immobiliser with remote activated alarm are fitted as standard. The option list includes contemporary features including an advanced touchscreen multi-media system with iPod and MP3 connectivity and a reversing camera. Also available as extras are electric folding mirrors and heated seats. The boot is where a boot should be but it is not very big. However there is plenty of room behind the front seats for items, although not hidden away. Top speed is given as 178mph, which is academic in the UK, and not that practical on the Continent either. It is a superb road car, fine on motorways with an excellent ride (and quieter than a Porsche Cayman), perfect on country roads, and surprisingly OK in town. The car is very nimble, and, unlike previous Lotus, flexible too. It is happy at low revs with plenty of torque available. City driving proved to be no problem providing one used the large door mirrors rather than the silly mid-screen offering. That reflective device was virtually useless. The Lotus Evora is not for everyone but is some motor car. Starting at £51,500 it undercuts the Jaguar F type which is currently only available in drop-head form. The Porsche Cayman fixed head starts at less but the extras quickly add up. Rivals include Various models of Ferrari and Porsche plus Caterham, Jaguar and Audi, BMW and Mercedes Benz.